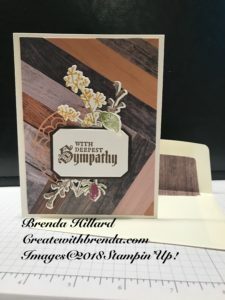 It’s a Stampin’Up! Birthday Celebration! 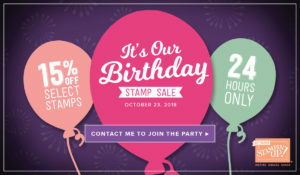 It’s a 30th Birthday Stamp Sale, but it’s for 24 HOURS ONLY- so time is of the essence! Spread the word to your stamping friends right away. Another Wonderful Year. I just love the fonts and sentiments in this set. 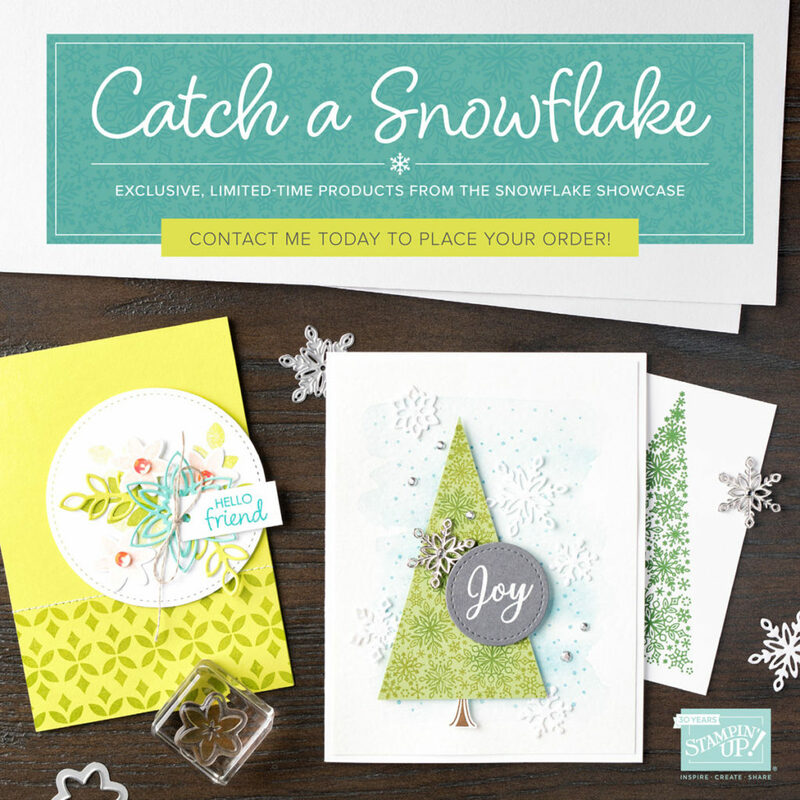 Click HERE for the list of Stamp sets included in this SALE! Use HOST CODE UM74UKU7 when ordering online to save on shipping! I will be placing an order on Saturday 10/20. Please have your online order in by noon. If you want me to place your order, call or email it to me by noon also. If ordering online, be sure to use HOST CODE VK9KSGSU to save on shipping. 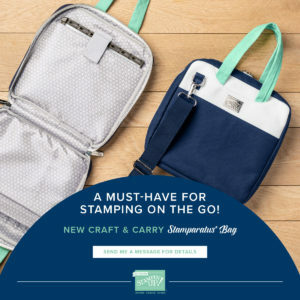 *if your order is over $150 in product, do not use the code as you will receive Stampin’ Rewards to redeem for FREE product. All customers who order in October will receive a package of the red rhinestones. *minimum $25 in product. I will be hosting a Holiday Open House on Saturday 10/7 from 1-4pm at my home. Everyone is welcome, bring a friend for a fun afternoon of make-n-takes, light fare and refreshments. There will be hourly prize drawings. Hope to see you! Be sure to leave a comment on any of my posts to get entered in my weekly PRIZE PATROL drawing. 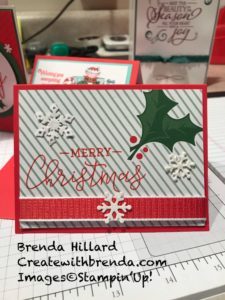 I will be hosting a 2018 Holiday Open House click HERE for details. Hope to see you there! If you would like the 2018 Holiday Catalog, I would be delighted to send you one, just let me know. There is a link to the digital version on the right side of my webpage. Paper Pumpkin orders and activation are due on October 10th. Don’t delay… We will be meeting at my home on November 3rd at 9:30am for “Paper Pumpkin on the Porch” please let me know if you are planning to attend and/or need help ordering or activating your code. The new HOST CODE for this ordering period is SK4BHQ3E. Please use this code when ordering online and if your order is less than $150 in merchandise. This code will be valid until October 20th. If your order is over $150, please contact me. This month I will be treating you to a package of the red rhinestones, along with my thank you card for all orders over $25 in merchandise. JOIN MY TEAM! I am looking for recruits to join my team. Why not be your own best customer and enjoy the benefits of a 20-25% discount on your products. Contact me if interested in the opportunity! Here is a sample of this week’s featured “Product of the Week”. 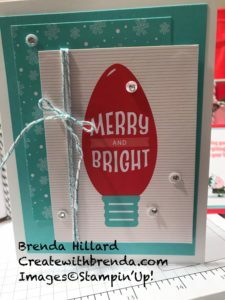 It uses the Festive Farmhouse Designer Series Paper and the Layering Oval Framelits. The Festive Farmhouse Suite is found on page 13 in the 2018 Holiday Catalog. Your comment is appreciated and enters you in my weekly PRIZE PATROL. 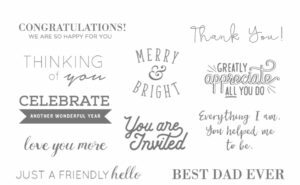 *This week there is an exciting announcement from Stampin’Up! Regarding a new line of products that will be available November 1st. It is called the Snowflake Showcase and it is beautiful! Stay tuned for samples, my products from the showcase should be in today’s mail! *I would like to extend an invite for you to join my team. This is the first time I have done this on my website, but I really want to grow my team, and the only way to do that is to ask! If you are asking yourself, “Why would I want to do this?” Here is just one of many reasons, you can be your own best customer. By becoming a demonstrator you get a 20-25% discount on all your purchases! Please click HERE to look at what can do for you. *I will be placing an order on Saturday October 6th. Please have your orders to me by noon. If you are placing your order online,and your order is less than $150, be sure to use HOST CODE 632PGW93 to save on shipping. Any order over $30 in product will receive a pack of the Red Rhinestone Basic Jewels on page 19 in the 2018Holiday Catalog. 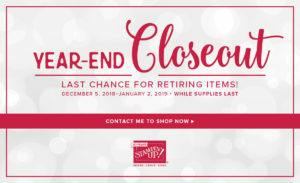 If your order is over $150, you will be able to use your Stampin’Rewards for anything on your wishlist. *I will be holding a Holiday Open House at my home on Saturday October 27th from 1-4pm. 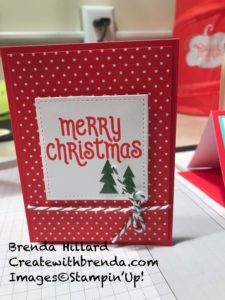 There will be make-n-take projects, lots of products on display, samples from the Holiday Catalog along with light appetizers and refreshments. 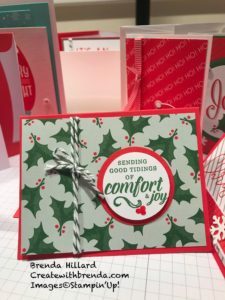 Stop out with a friend to get entered for my HOLIDAY giveaway. The new host code is 632PGW93. The next I will place is on October 6th. If you order from my online store, and it is under $150, be sure to use this code to save on shipping! Registration deadline for “ Get Your CREATE on at the Winery” is October 6th. Seating is limited to 10, so register now. Click HERE for details. This is the last week for Bonus Days Coupon Code redemption. Get an item out of the Holiday at $5 OFF. 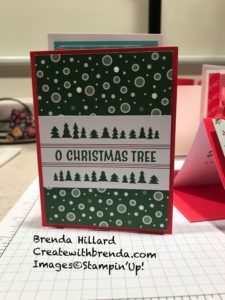 Here it is, this week’s update to what is happening at createwithbrenda.com. 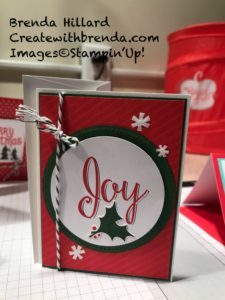 I hope you are enjoying the daily posts, and all that is happening in my stamping studio, and at Stampin’Up! When placing your online order be sure to use HOST CODE RPQGRV2X . By using this code with your orders you will save on shipping and receive a FREE gift from me. If you would like me to key in your order, I will be placing an order this Saturday 9/22. Check out the Clearance Rack, again be sure to use the HOST CODE listed above when ordering. 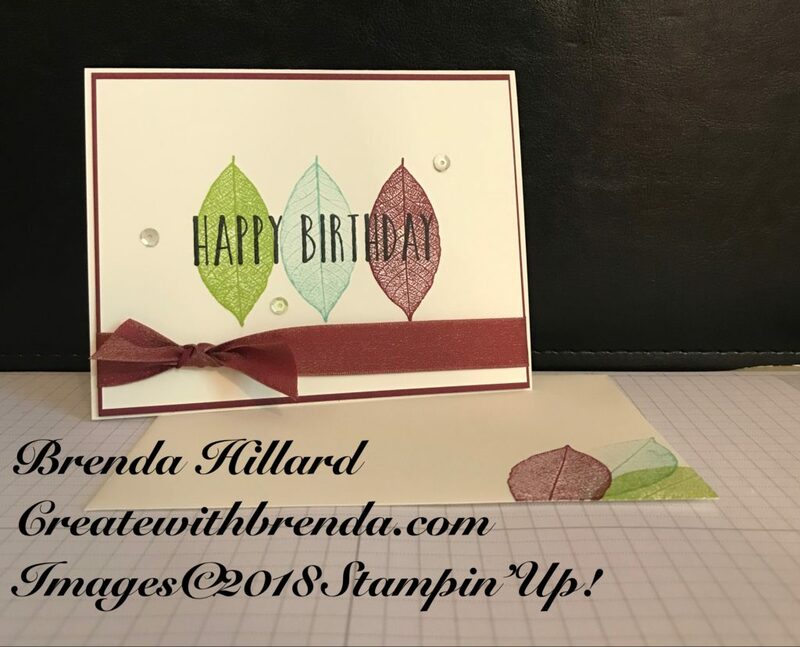 I will be hosting another stamping event “Timeless Tidings” at the Dennis Drummond Wine Company on Tuesday October 23 at 6pm. 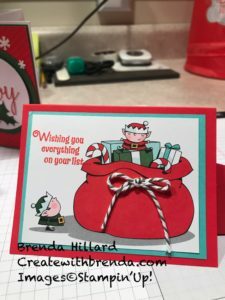 The cost of the class is $40 and includes 20 Christmas cards and a beautiful storage tin. Space is limited so be sure to RSVP by October 6th to save your spot. Paper Pumpkin! If you did not join or re-activate by September 10th, be sure to do it now as this month’s kit is adorable and with the holidays right around the corner, you won’t want to miss out on all the FUN. To sign-up, again go to my online store and select Paper Pumpkin from the left side of my storefront. Be sure to leave a comment on my blog and Facebook posts to get entered in my weekly Prize Patrol drawing! One last thing, the featured “Product of the Week” is the Rooted in Nature stamp set. 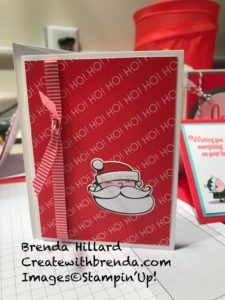 This suite offers the coordinating Big Shot dies, and is BUNDLED which means you save 10% when ordering both products. 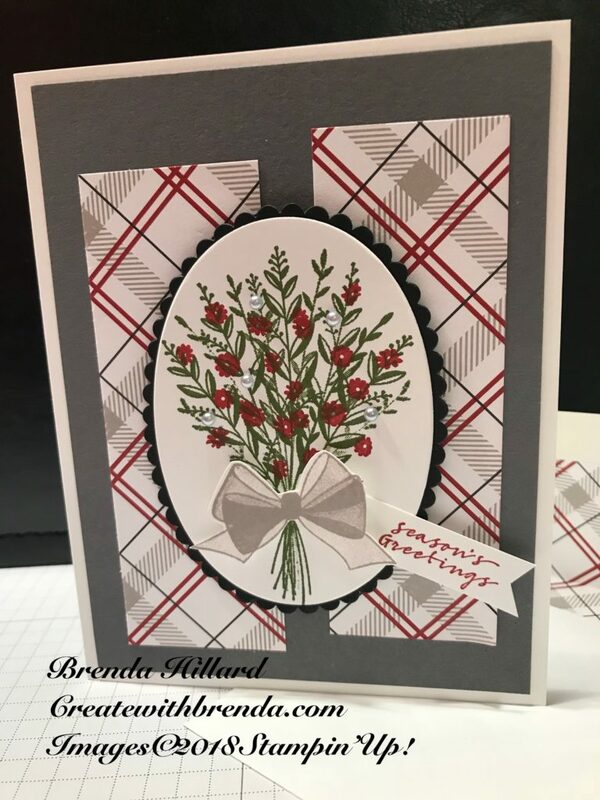 Here is a sample I designed using this beautiful set.